Hamblin, Cherrill Larson, 86, passed from this mortal life on July 22, 2011, at her home in Gilbert, Arizona, after a five month struggle with colon cancer. She was born in Douglas, Arizona, on December 10, 1924, to James Milas Larson and Katie Welker, who moved the family to Phoenix, Arizona, shortly after Cherrill was born. 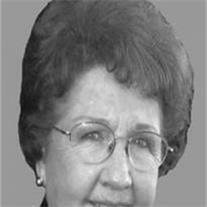 She attended public school in Phoenix where she graduated from North Phoenix High School in 1942. It was there that she performed as a cheerleader and gained a reputation as the “Belle of the Ball.